The Pearl: A resurfacing laser that gently and safely treats signs of aging and sun damaged skin. Who is the ideal candidate for the Pearl treatment? Anyone with a lighter skin tone: 1-3 on Fitzpatrick Skin Scale that has sun damaged skin and/or fine lines and wrinkles. Darker skin tones and clients with melasma are contra-indicated. If you have a history of cold sores, pre-treat with an antiviral 3 days before, the day of treatment and 3 days after treatment. A pattern of light pulses burns off the top layer of skin, but at the same time offers collagen stimulation of lower skin layers. This unique wavelength of the Pearl allows for great results with more protection than an Erbium laser that simply removes the top layer of skin. Downtime is time spent recovering from a procedure. You will want the day of your procedure and the next 4 days to recover. The skin will look red, dark spots get darker before they peel, then the peeling/sloughing begins! The neck and décolleté takes longer to heal. We use a medical grade topical anesthetic to keep you comfortable, most describe the discomfort as 2-3 on a 1-10 scale. After the treatment the skin feels hot for about 45 minutes, but you are cooling with the Zimmer cooler until the heat dissipates. The most common issue is contact dermatitis: things that you are usually not sensitive too, can irritate/inflame your skin. Avoid touching your treated areas, use washcloths and towels that have not been washed and/or dried with fabric softner. Always wash your hands before you touch your healing skin. If you experience severe itching and swelling, oral Benedryl, 25-50mg, as well as topical Hydrocortisone 1% can relieve the inflammation. If you peel or pick the skin as it is sloughing off you can scar! If you get sun exposure on inflamed/healing skin you can scar! Temporary skin pigment changes can happen as well-No sun and No picking! The treatment area must be protected! Aquafor is used to provide a physical barrier while your skin is healing. Soak clean washcloths in vinegar and lay on the face to promote healing. Repeat this wash, soak and reapply process 6-8 times a day. The more you do this, the faster you heal. DO NOT: pick flaking skin off = scarring. NO SUN EXPOSURE: Do not expose the healing skin to any sun. Once the peeling is done, you can resume use of a good ZINC-BASED SUNSCREEN. Use only mild cleansers and mild moisturizers (Cerave or Cetaphil) for about a week after the skin has peeled. 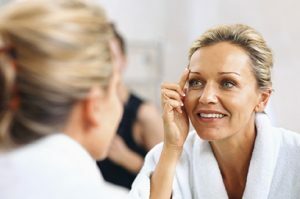 No need for retinols or glycolic acids or any chemically active exfoliations or stimulators: we need no more exfoliation or stimulation during this time, allow the skin to just heal.